“Batboat” auctioned by Bonhams in the U.K. The ‘Batboat’ series of racing motorboats was designed between 1912 and 1914 by John Montague Batting, a keen sporting automobilist and sailor. ‘Batboat III’ was built specifically to contest the Harmsworth-sponsored British International Trophy race of 1914 and was of lighter construction than the heavyweight opposition, representing a new direction in racing hydroplane development. The original powerplant was an in-line six-cylinder aero engine built by the Green Company, rated at 100 horsepower. A detailed description of this craft’s pioneering method of construction is recorded in the Motor Ship and Motor Boat dated 6th August 1914, copies of which are available for inspection. In the same edition of this magazine a detailed account is given of the first round of trials for the British International races held under the auspices of the Royal Motor Yacht Club at Netley, off Southampton water. ‘Batboat III’ finished 2nd in the first trial behind the much more powerful (300 horsepower) ‘Crusader’, the average speeds for the two fastest boats being 36.6 and 35.0 knots respectively, and the maximum speed attained nearly 50 knots. In the event, the commencement of hostilities in Europe meant that the actual races were never run. Although racing for ‘Batboat III’ would be postponed indefinitely, the advent of war saw it deployed in a new role: as mobile test-bed for nautical engineering and development. Subsequently, during the 1920s, ‘Batboat III’ was used for research into torpedo design, being fitted with two Vauxhall 30/98-type engines and twin-screw propulsion. The latter form of drive, when applied to torpedoes, prevented them from turning off course, thus enabling much more accurate targeting. The Motor Boat of August 31st 1934, some ten years later, gives a brief insight into that purpose within an article relating to exploits of the second known owner of ‘Batboat III’ – a Commander Belleville, RN – who had acquired it in the early 1930s. A photograph reproduced in the article shows modifications to the engine covers and cockpit layout, which was extended aft to accommodate two persons in comfort with a small bench seat behind them. Exhaust stubs can be seen protruding from the port-side hull, while an examination of the hull today reveals later repairs covering these exhaust modifications. Commander Belleville and, subsequently, members of his family retained ownership of ‘Batboat III’ well into the 1980s, when it next changed hands. By this time further changes had been made in the interests of maintaining the craft for pleasure pursuits. 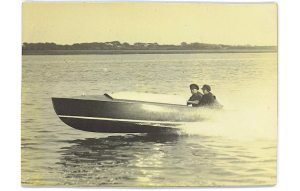 Some time prior or just after WW2, the twin engines were removed and replaced by a single Gray Marine ‘Fireball’ motor giving a top speed of approximately 40 knots – no mean feat for a boat now 60 years old and still going strong! 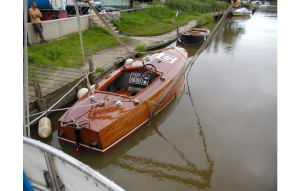 Because ‘Batboat III’ was now principally used in salt waters, the original lightweight aluminium deck fittings had been replaced by more durable bronze, and the aluminium engine covers substituted for heavier and more stable ones of cedar and mahogany. 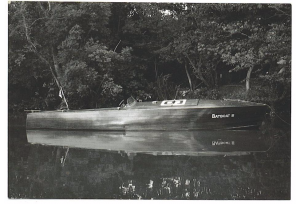 Still sporting racing numbers from the late 1930s, ‘Batboat III’ was offered for sale in this form in the mid-1980s, and a comprehensive survey was commissioned by the new owner from Derek Haswell, naval architect and yachting consultant of Broadstone, Dorset. His extensive report (dated 17th July 1986, copies available) is of great interest, detailing once again the boat’s original construction methods and remarking on its fine build quality and excellent state of preservation. 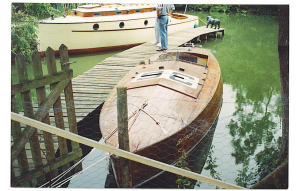 In this form the boat was purchased by the current owners a year or two later, and it has since undergone further restoration over an extended period in order to re-equip it using components more suited to its original conception. 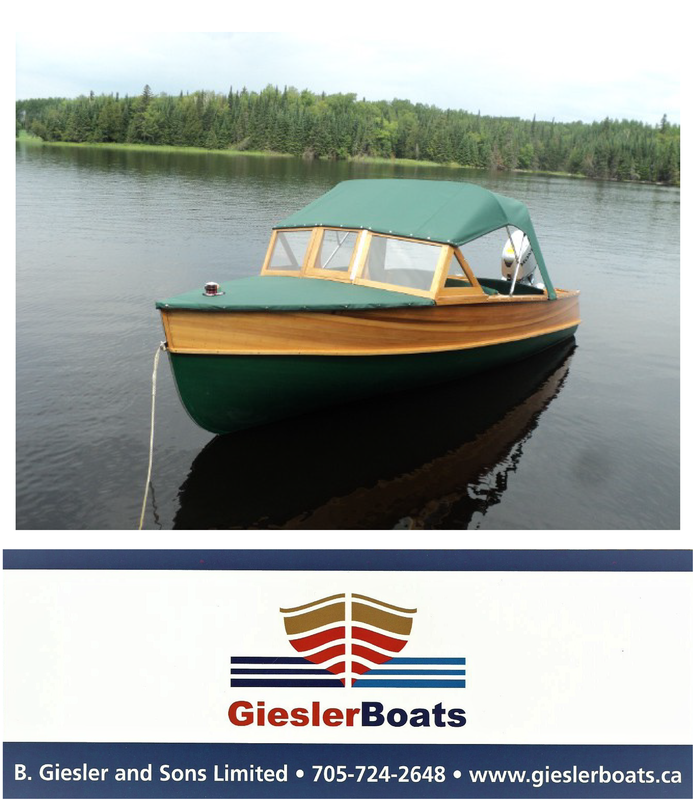 The hull was stripped and completely checked throughout, all but some decking being found perfectly sound, particularly the double-thickness hull with its oiled canvas sandwich construction, which remained perfectly intact. Some deck planks have been replaced to match the originals, while all the deck fittings remain as fitted in the 1930s. Motive power is now supplied by a marinised Hispano-Suiza V8 aero engine of the type fitted to such WWI aircraft as the SE5-A and SPAD. 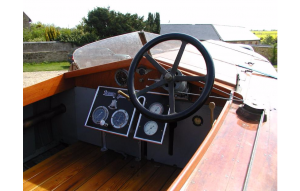 This particular 10.5-litre example with Capitol Marine conversion dates from the early 1920s and is rated at 220hp; it has been refurbished and is a snug fit in the hull, which has recently been re-varnished and repainted below the waterline. Capitol Marine’s conversion provides a 12-volt electric self-starter, together with a dynamo for charging and lighting. Ignition is by twin distributors. A new phosphor-bronze propeller has been specially computed to match the power output and is geared to give approximately 50 knots at around 2,000 revs. Still to the original layout, the steering is by wire cable externally to starboard by pulleys and quadrant atop the rudder. The cockpit is equipped with new wickerwork seats with leather cushions to an aviation pattern of 1914, while the dashboard is a new aluminium casting incorprating a complement of instruments including an early chronometric rev-counter, oil-pressure gauge, clock, etc, all of which are approximately contemporaneous with the original build date. 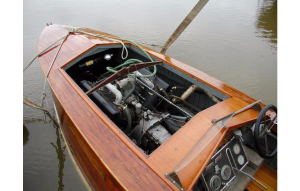 Currently the engine is running in after refitting, and a further period of commissioning may be needed on the water. Batboat III comes with a tailor-made, dual-purpose wheeled cradle, for either slipway launching or permanent storage when off the water, which can easily be accommodated on a flat-bed transport trailer or truck. A folio of useful documentation and photos relating to its history, together with two large-format original photographs, taken by Beken of Cowes in the 1950s, accompanies this important and extremely rare survivor of the Golden Age of motorboat racing.